Recently, someone asked me why I created Bold Blind Beauty; my answer was twofold—devastation and rebirth. It was June 2009 and earlier in the year, I had my third and last vitrectomy to hopefully restore the sight in my good eye. I was excited because the successful outcome of this surgery could allow me to regain my driving privileges. Unfortunately, during the recovery phase, my retina specialist found bleeding at the back of the eye. The treatment plan called for Avastin an injection in the eye to stop the bleeding. A couple of weeks later, my brother, son, and I went to Cleveland Clinic. The drive to Cleveland Clinic Cole Eye Institute was about two hours but with renewed hope, worth the trip. After all, during my last visit two years earlier, they saved the sight in my bad eye by repairing my detached retina. The news I received during this trip wasn’t good. When the doctors told me “we’re sorry there is no more we can do for you” I think I was in a semi-catatonic state. There was no reaction, no tears, no outburst—nothing. On the drive home, my mind could not grasp what I what the doctor’s told me. Over the course of the next few weeks, I was as scared as I’ve ever been. I mean, I had big plans before all of this eye stuff happened. I received a promotion at work, bought a house, got married. My husband and I were refurbishing our home to sell it then build our own. Now I’m legally blind, do I even have a future? My problem-solving skills improved significantly during and after my new ‘legally blind status.’ There wasn’t a roadmap to follow for life after sight loss and I never felt more lonely. I had to make some tough decisions on how I was going to move forward the most significant was self-reliance. This meant a change in course by leaving my marriage, home, and beginning anew. Even with so much support from my employer, co-workers and those closest to me, the strain of trying to find my groove got to me. Looking like I could see, yet couldn’t, was exhausting. While I may have looked like I was adapting I was struggling. Every time I used my white cane I felt like a beacon. For a minute it seemed like my life was in ashes with the chaos that ensued. However, eventually, with the help of family and friends, I would connect with a low vision specialist and others who became my lifeline. Have you ever felt like you don’t fit in? I sure have, most of my life actually. So it shouldn’t have been odd for me to be among the ‘too sighted to be blind but too blind to be sighted camp.’ Yet, my local blind community embraced me—I was home. When I was asked to do a makeup presentation at our Pennsylvania Council of the Blind (PCB) annual convention I found my purpose. Beauty is not reserved for ONLY those who can SEE, beauty, REAL beauty knows no limits. Bold Blind Beauty—Real Beauty Transcends Barriers seeks to empower blind women while connecting sighted and non-sighted communities. Collaborating with creatives like Jennifer Barrille, Laura Sottile, Jessica Marano, Kathy Keck and others is presenting a unique opportunity for Bold Blind Beauty. 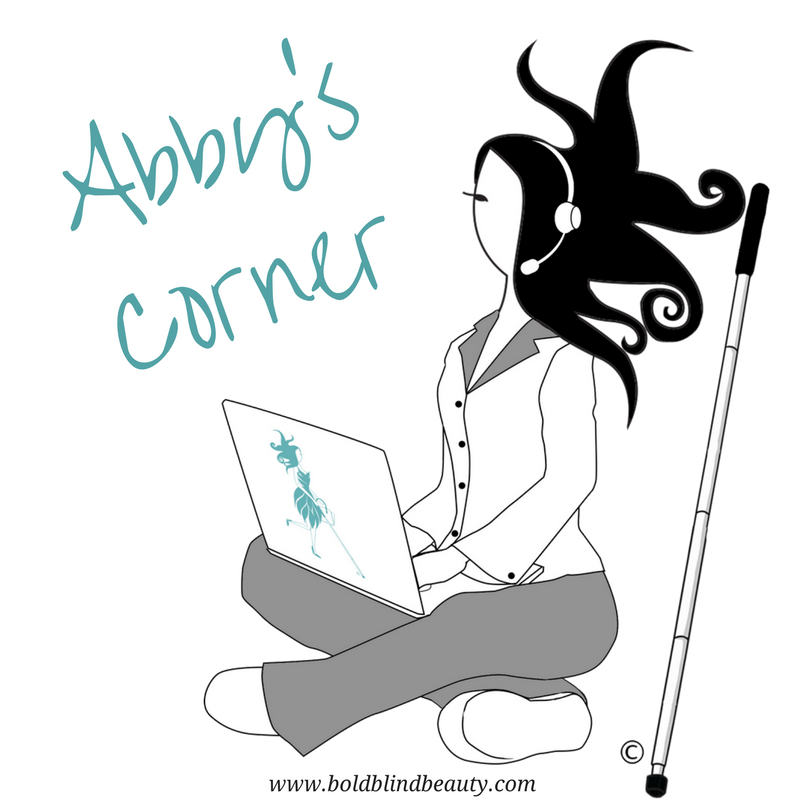 Our fashion icon Abby is stylish, she uses a white cane, and she’s changing the way we look at blindness. 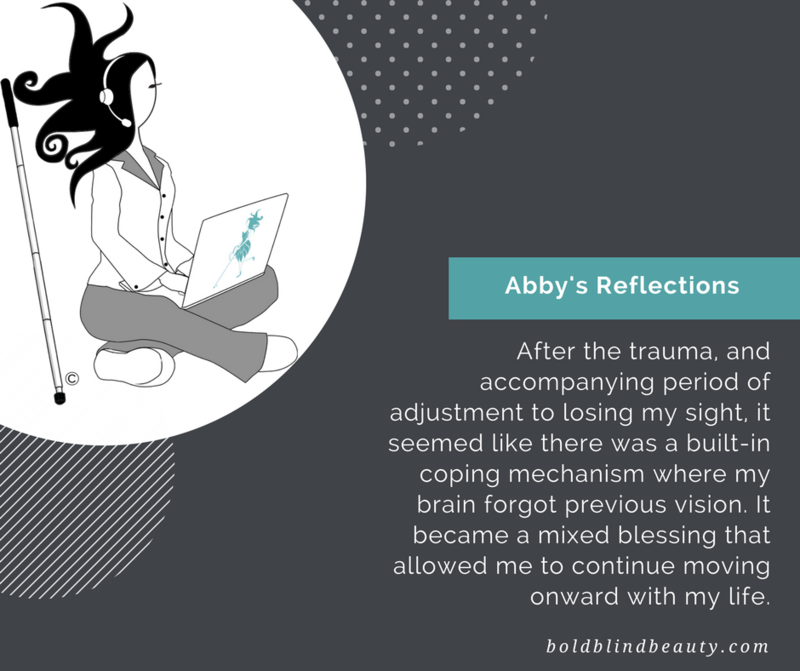 Working to make Abby and all of our offerings accessible is our goal. Yesterday, I was able to upload our new one-of-a-kind embossed braille coffee mugs to our online store. The braille on each of these mugs is created by artist Kathy Keck of Loving Touch Connection. Abby is walking with her white cane in one hand and handbag in the other. The image is black with black heels and a stylish black dress made of panels resembling overlapping banana leaves. The dress panels gently curve from her nipped in waist to just above the knee. Her signature hairstyle is explosive. On this Good Friday afternoon, I wanted to take a moment to wish you Happy Easter greetings. I’m relaxing and spending time with my baby Alexis. Even though at 55 pounds she’s hardly a baby, Alexis is my retired guide dog and hence my family. From the Greek name Αλεξις (Alexis), which meant “helper” or “defender”, derived from Greek αλεξω (alexo) “to defend, to help”. This was the name of a 3rd-century BC Greek comic poet, and also of several saints. Alexis came by her name honestly as she was the most loyal guide dog a girl could ask for. We wish you not to lose the beautiful Easter feeling of new beginnings. May this spring bring you new hope, new friendships, and new perspectives. Abby is sitting cross-legged in her PJs (gray bottoms & white top with a gray collar). Her laptop on her laps has a teal Abby logo on the cover. Atop her signature explosive hairstyle, she is wearing a headset with microphone. Her white cane is propped up next to her. Abby with her signature explosive hairstyle is dressed in a teal tank top and gray exercise pants. She is on her knees hugging Alexis, a golden lab with a teal collar around her neck. And since Alexis has her own fashion sense she has a silver “Alexis” medallion on her collar. If you haven’t already heard, Ultra Violet is 2018’s color of the year. Pantone, the color people, are the premier authority on all things color. Being born sighted one of the things I was most grateful for was seeing color. While I can still enjoy colors, with my diminished eyesight I have problems distinguishing shades. We live in a visual world and thanks to the internet we also live in a virtual world. When visual and virtual worlds merge together, it creates an opportunity to engage with others on an unimaginable level. Being able to connect with anyone, anywhere in the world at any time is nothing short of magical to me. Yet the ability to fully engage in the virtual world leaves many people out in the cold. Ultra Violet, a reddish blue, is an abstract idea to a person who has never seen it before. Unfortunately engaging in the virtual world doesn’t stop at just color. Recently I read an article that said every day 2 billion photos are shared on Facebook alone. Imagine how many total images this would be if we included Instagram, Twitter, LinkedIn, and blogging platforms. Now consider descriptions are not on the majority of images on all social media. When you have little to no sight this is the reality for many of us. Every. Single. Day. Developers are working hard to make artificial intelligence better at describing images but we still have a long way to go. In the interim, skillfully painting with words, to describe images and colors can help engage our senses. Similar to a writer making stories come alive in our imaginations, for those of us who cannot see, words fill in the blanks. Color plays a major role in our lives. In fashion, being aware of color is helpful when buying apparel, cosmetics, jewelry, and accessories. While Bold Blind Beauty cannot restore sight to a blind person, it’s our hope we can become more mindful of others and together work towards a more inclusive world. Acceptance of any loss in our lives is a process. Losing eyesight and how you respond to it is different for everyone. For me and my friends, our lives have not only gone on after sight loss but we are living abundantly. While the process of losing eyesight is not easy, it boils down to choosing how you want to live. By placing more focus on what you have instead of what you’ve lost you can handle most anything. Many of us come to appreciate our sight loss as an opportunity to become a beacon of hope to those new to the experience. As we continually adjust to living without sight we gain new skills while leaning on our other senses. Another huge piece to the puzzle is for people to remember we are not our eyesight or lack thereof. The word “blind” has no special power over us and we are not subhuman. Our eyes simply do not function. 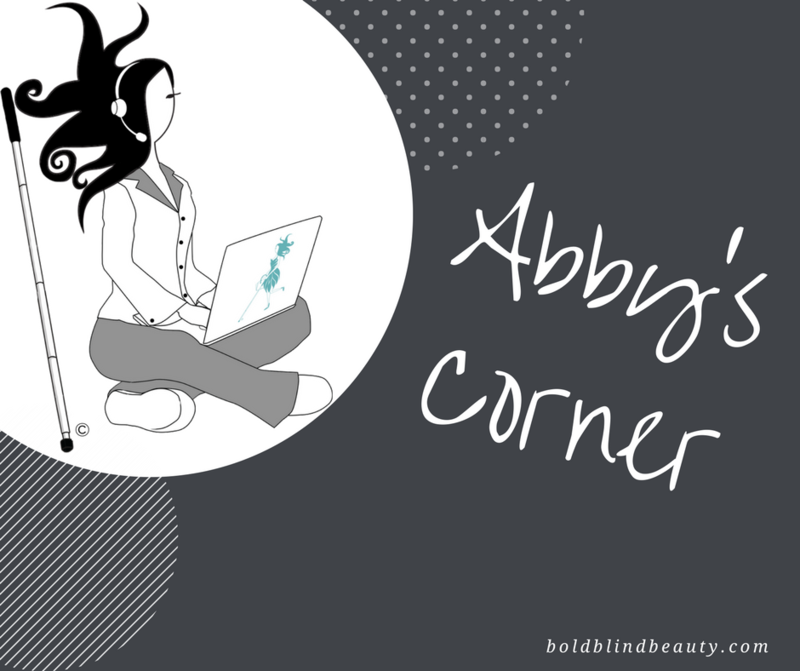 A gray, teal, and white boldblindbeauty.com template utilizing the ‘Abby’s Corner’ image of Abby sitting cross-legged in her PJs (gray bottoms & white top with a gray collar) with a teal Abby logo laptop on her lap. Sporting her signature explosive hairstyle, she is wearing a headset with microphone and her white cane is propped up next to her.